Home Videos World Aussie Blokes Make The Worst Husbands?!! Classic Video!! Aussie Blokes Make The Worst Husbands?!! Classic Video!! Well, it's an extremely dubious title to be awarded, but at least this latest study gave me the opportunity to tell my wife - "see, you can't be angry at me just because I hate housework - it's part of my culture!!!"... of course I'm joking, but the British study is actually being promoted as legitimate - the fact that only 12 countries were included in the study doesn't seem to create a question of sample size (I'm guessing, the whole report may be payback for the Aussie's ever-continuing dominance against the poms on the cricket pitch... to my mates in Great Britian, once again I'm only joking). 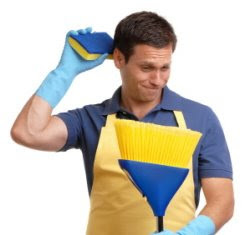 According to the study, Australian men make the worst husbands in the world because they loathe helping out with the housework. The data collected by economist Dr Almudena Sevilla-Sanz from Oxford University, found that women wanting to 'tie the knot' were better off finding a bloke from Scandinavia, Britain or the US as opposed Australia. She went on to further state, that based on her study of 12 developed countries, "men and women were both more likely to cohabit or marry if they believed their partner would help out with the household chores and childcare". The study ranked Australia as the least egalitarian society - Aussie blokes being unattractive marriage partners because they were more unlikely to do household chores. The most egalitarian countries were deemed to be Norway, Sweden, Great Britain, the US and Northern Ireland - their men being the most attractive marriage partners. Following on were the Netherlands, Ireland, Spain, New Zealand, Japan, Germany, Austria (and Australia in last place). The study's conclusions were based on a survey of 13,500 men and women aged 20 to 45 from each of the 12 countries.... each participant was asked about their attitudes to gender, housework and childcare responsibilities. The final paper generated from the study, will be titled "Household Division of Labor and Cross-Country Differences in Household Formation Rates" and is due to be published in the Journal of Population Economics. See - I told you that I have an excuse!!!!... NOT!!! ABSOLUTELY CLASSIC VIDEO - "THE AUSSIE BLOKE"
Aussie aussie aussie... oi oi oi!